Yonsei University (연세대학교; 延世大學校) (Korean pronunciation: [jənseː]) is a Christian private research university, located in Seoul, South Korea. Established in 1885, it is one of the oldest universities in South Korea and is widely regarded as one of the top three comprehensive universities in the country. In 2009 the university was ranked 151st in the world by the British university evaluation agency Times and Quacquarelli Symonds. The university was formally established in January, 1957 through the union of Yonhi College (연희전문학교; 延禧專門學校) and Severance Union Medical College (세브란스 의과대학; 세브란스 醫課大學). This was a result of a lasting bilateral cooperation between the two colleges which had begun in the 1920s. 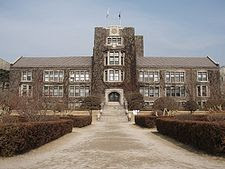 The institutions were new to Korea at the time of their inception — Yonhi College was one of the first modern colleges, founded originally as Chosun Christian College (조선기독교대학; 朝鮮基督教大學) in March, 1915, and Severance has its roots in the first modern medical center in Korea, Gwanghyewon (광혜원 廣惠院, House of Extended Grace), founded in April, 1885. 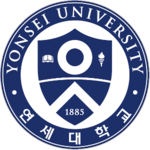 As a tribute, the name 'Yonsei' was derived from the first syllables of the names of its two parent institutions, 'Yon; 연; 延' from Yonhi College and 'Sei; 세; 世' from Severance Union Medical College. As of April 1, 2009, Yonsei University has a main campus in Seoul, a secondary campus in Wonju, South Korea, 26,530 undergraduate students, 11,437 graduate students, and 4,178 faculty members. In 1885, King Gojong of the Chosun Dynasty requested Dr. H. N. Allen, an American Northern Presbyterian missionary who volunteered as a royal family doctor, to set up a hospital named Jejungwon in Gurigae. On March 29, 1886, sixteen students were selected and the school was opened. This marked not only the birth of Yonsei University, but also the starting point of modern medical education in Korea and among the first in Asia. Later, Dr. O. R. Avison, a Professor at the University of Toronto Medical School, became the head of Jejungwon, and through a donation from Mr. L. H. Severance, the hospital was reconstructed and the medical education institution was finalized. They respectively became Severance Hospital and Severance Medical School. The first seven graduates in 1908 received the first doctors’ licenses issued by the Korean government. In 1947, the school obtained permission from the Ministry of Culture and Education to establish a 6-year long course program at Severance Medical College. During the Korean War, a humanitarian aid hospital was established to provide medical services for refugees and the injured. Meanwhile, in September 1906, Miss Esther L. Shields established a nursing school within Severance Hospital as a professional institute to train outstanding nurses. The school produced the first nurses in Korea in 1910. In 1968, the school was elevated to College of Nursing.